IPOH MALAY: Ipoh Malay reject Bahasa, turn to English from now on. Ipoh Malay reject Bahasa, turn to English from now on. It was the 10th year of this blog existence. 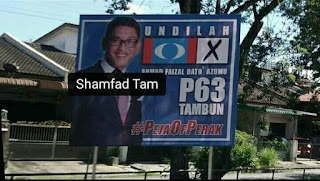 From the day everyone blame Khairy and Pak Lah, until he become the most liked carachter in the opposition side of Pakatan led both federal and state government. The blog genuinely me without team that nagging for 'kepala agong' post 2008 which the age of blogging. Fighting for the Dacing, it once ranked among top 20 most read local politic blog. But blogging is now left deserted with the reason of, people are not reading anymore. They wish to cut short in making decision, and what stop them doing the same in finding out reasons. Today, I will revamp the whole blog into a conceptual room of idea. I'm not going to force any idea radically as in the end you wouldn't gain anything having space shuttle while the rakyat have no idea how it work as they preoccupied with plenty episodes Malay drama. I can hang a RM25 banner wrote " Melayu Bukan Pendatang. 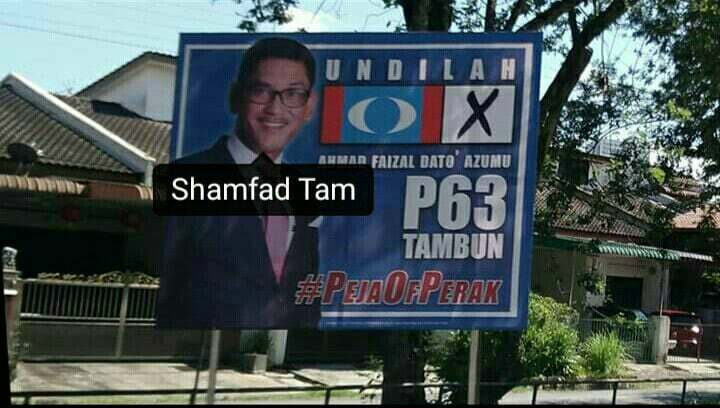 Jangan Main Api " in his Ipoh Barat constituency that I was working at on weekday basis. But what was the reason to get ignited in the first place. It was an academic argument though, you can't set knowledge ablaze just justifying your state of denial. And what an idea worth stupid tag when you force flies to bunch of smelling good potpourri instead of foul smelling carcass. What was the essence of purity is there for a truth that we try to inject into the brain of people that hunting for lies. It is not because I was supporting UMNO before and facing a once slurred political side ruling. The winning of Pakatan Harapan, after this blog posting to UMNO giving decent advise, telling the people that there is attempt to manipulate their shallow knowledge with lies, has made more doors open which pleasantly accepted and the euphoria of new adaptation in fragmenting a new path of future. Based on my experience in advising my own people through UMNO, and findings that lead to my final summary, no matter how severe the degree of despair of the people on the end term outcome for PH government, they never wanted UMNO again. When they can validate their resentment without experiencing the implausible ignorance in within, just imagine on how does those who loyal to the party, not the leader, when they need to face war of ideology from both. And for that, I reject both the UMNO and it allies and the PPBM and it convenience marriage wives. It is the turning point in favoring my own people and seeing them became gradually incapable in making a decision in broad vision by analysis and risk assessments. My people does not honor knowledge more than Malay soap operas and TV comedy contests. When I said GST is vital to the economy of the people that craving for a better Malaysia, I was teased with repulsive classification of "dedak" or livestock pallets that literally means, I was paid to show a strong disagreement, but in Malay sense of dignity, is far worse as dedak is usually spread to chickens and consume is greed way. I will restart blogging on the second decade in English. I will stand on making English as official language of Malaysia, like the day when Malaya gain it independence. I will endorse abolishment of Bumiputra status along with abolishment of vernacular education that bond to each other vis-a-vis. I will try my best to be on the right spectrum in reflecting the cause I now championed for, creating equality in dreaming of solid and unite Bangsa Malaysia. But be wary, I will offer any available assistance to those whom very much on having their state to withdraw Malaysia with honest words, facts and all the vulgar slur to ensure the idea is demanded with basis. Because beside Malaysia , I have nothing to protect if my lovely Perak ruled out. Not my own people, a party that i was in. But as long as blasphemous pest is around, you will find out that my words towards my opponent is worse than Taliban. I do like ur english written.. calm n well said! Btw i'm no supporting pakatan haprak.. still good with umno..
but i'll come to read ur blog regularly..